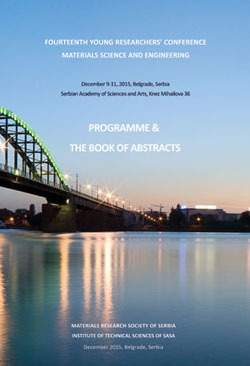 The 14th Young Researchersc Conference - Materials Science and Engineering (14 YRC), co-organized by the MRS-Serbia and the Institute of Technical Sciences of SASA, was held on 9–11 December 2015 in Belgrade, Serbia. This YRC was the fourteenth edition in a series of annual conference started in 2002. The Conference traditionally gathers post-graduate, master and PhD students, as well as PhD holders younger than 35 years. The main aim of the Conference is to enable young researchers, working in the field of materials science and engineering, to exchange ideas and experiences about their research, as well as to make a good base for future collaboration. The Conference does not charge a participation fee. During the three days of the Conference, 61 lectures on eight topics (Biomaterials, Polymers, Nanostructured Materials, New Synthesis and Processing Methods, Theoretical Modeling of Materials, Materials for High-Technology Applications, Catalysis and Environmental Science) were presented by researchers from seven countries (Belgium, Croatia, Czech Republic, Montenegro, Poland, Republic of Srpska B&H and Serbia). For the first time, Master Classes were given by two eminent scientists, Prof. Dr. Bojana Obradović and Prof. Dr. Velimir Radmilović, both from Faculty of Technology and Metallurgy, University of Belgrade, Serbia. This year, for the eighth time, the best young researchers were awarded. As the presenting authors, Bożena Sikora from the Institute of Physics, PAS, Warsaw, and Dr. Zoran Jovanović from the Vinča Institute of Nuclear Sciences, University of Belgrade, Belgrade, Serbia, won a free participation at the YUCOMAT 2016 conference. As the best young researcher from Serbia, Zoran Jovanović was elected by the MRS-Serbia as its representative at the EUROMAT-Junior 2016 Conference, which will be held in Lausanne, Switzerland, on 10-14 July, 2016. The next meeting, the 15 YRC, will be held on December 7-9, 2016, in Belgrade, Serbia.